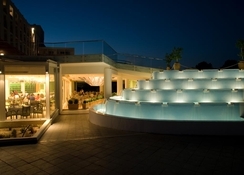 The Eden Roc Resort Hotel & Bungalows is a 4-star hotel located on the idyllic island of Rhodes. 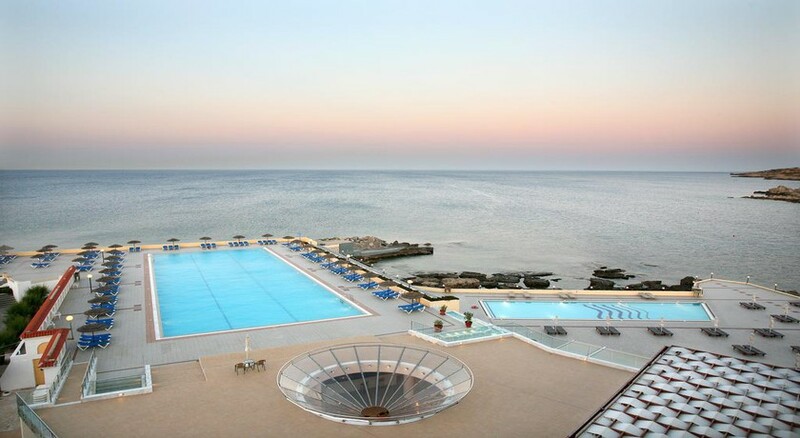 Enjoy the breath-taking views of the Mediterranean Sea as you relax in one of the three stunning swimming pools, plus a kid’s pool. The Eden roc Resort is close to the stunning Kalithea Bay and Rhodes Town, making it a great base for day trips. This family-friendly hotel has a variety of activities available for guests such as a mini-club for children, a gym, a relaxing spa experience as well as a private pebbled beach. This is the ideal location for families, friends and couples alike, thanks to its excellent facilities and comfortable rooms and suites. The hotel is a short distance from the capital so there is plenty to see and do outside of the hotel if you wish. 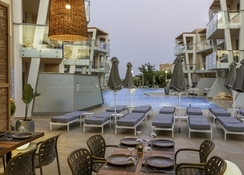 The Eden Roc Hotel is 18km from the Diagoras international airport as it’s located within the borders of Rhodes and Kalithea. There is a bus stop available for guests to use outside the hotel which takes you to and from Rhodes Town and other local towns nearby. Other local attractions include Koskinou Village (800meters), Kalithea Springs (1km), the lovely town of Faliraki (7km) and if you want to soak up some of the history of the island then you can visit Rhodes old town which is just 3.5km away from the hotel. The Eden Roc Hotel & Resort boasts room types to suit all guests, including an Executive Suite with Balcony and Seas View, a Bungalow with Balcony and Pool View, a Double or Twin Room with Balcony and Sea View and a Double or Twin Room with Balcony and Garden View. All rooms come with a shower, air conditioning, a bathtub, living room, a hairdryer, they are wheel-chair accessible, there is a tea/coffee making station as well as a TV, mini fridge and telephone. The views from balcony’s in this hotel are wonderful, guests can enjoy the sunrise and sunset while looking over the calming Sea in the morning and evening, it’s the perfect way to start and end your day. There are eight restaurants that guests can indulge in at the Eden Roc Hotel, including the main restaurant, which offers a large buffet for breakfast, lunch and dinner, the Mediterranean restaurant which serves many international dishes, The Grill House which is open daily from 19:00-22:00, the Italian restaurant open from 19:00-22:00, Meze the Greeks serving restaurant open from 19:00-22:00, the Thalassa beach restaurant open between 12:30-14:00, Arun the Asian open kitchen and the Taverna which is located on the beach. The variety of restaurants are sure to have something for the whole family to enjoy. Besides the gorgeous hotel pool, there is bike rental on the beachfront, canoeing, mini-golf, snorkelling and windsurfing as well as many other great activities that guests can take part in during your stay at the Eden Roc Hotel. The in-house kids club is a great place for our younger guests to enjoy, with plenty of fun-loving games and activities set by the hotel staff each day. The entertainment programme really does have something for everyone no matter your interests or hobbies. Cards accepted: Visa debit, Mastercard, maestro, visa and American express. Open from April to late October. There is a 24-hour front desk services, concierge service as well as room service and housekeeping. Rhodes airport is a 25-minute drive. I have been recently on 8 days of holiday with my Husband at Eden Rock Hotel. Must say it was fantastic. Hotel has a lot of space, champagne bar, beach, 2 swimming pools, 5 restaurants with variety of food. If you are fussy you will find something for yourself. Every evening there was entertainment and all staff has put an efforts to see happy guests. I had my birthday during stay, and with hotel staff my husband prepared dinner surprise with cake and flowers! It was amazing. Must say especially one waitress Daniela, was so nice, kind and always helpful. Thank you for making my holiday so fantastic. My wife and I went here for our honeymoon! Staff could not be faulted! Every staff member made the effort to call us “Mr & Mrs Robinson” which I personally thought was a lovely touch! Food was amazing the facilities were unbelievably clean and the service was spectacular! We went for a week but we wish we went for two! It’s a bit of paradise! We were upgraded to a beach view room also! We spent little to no money while here only on a taxi! The place is spotless and we will definitely be back for a week if not two next year! Excellent hotel but the transfer confusion on arrival at airport was not good.